The roof of Martin Santana’s home in Adjuntas, Puerto Rico. When Puerto Rico went dark a couple weeks ago, Mayra Nieves Rosa didn’t even notice. She was too wrapped up working from her home office in the San Juan metro area. It’s not like her lights went out. You see, the sun powers Rosa’s home—enough of it, at least. Any time the lights go out across the island, her nine solar panels keep her at-home office and fridge energized. Rosa and her partner are among a growing number of Puerto Ricans who went off the grid after Hurricane Maria, and aren’t looking back. Rosa’s brother-in-law, Manuel Rivera, helped her install the panels in December after she’d been living without power for more than three months. Rivera’s house in Mayagüez is also solar-powered, but he’s had his self-installed system since 2013. He didn’t need a hurricane to push him—the math just made sense. His monthly energy bills, which used to run $200, are now around $10 a month. And that’s just with solar panels covering the “necessities,” as he put it. He still wants to add more. So does his sister-in-law. “Something happening” has become all too easy to imagine in wake of Hurricane Maria. The Category 4 storm ruined the island’s already-vulnerable power grid, whose lines are scattered across mountainous terrain and have proven tricky to repair. More than seven months after Maria, about 26,000 Puerto Ricans remain without power. Little blackouts here and there have become pretty common these days, Rosa said. And of course, there are also bigger blackouts, like the brief island-wide one that brought Puerto Rico’s plight back into the national spotlight last month. 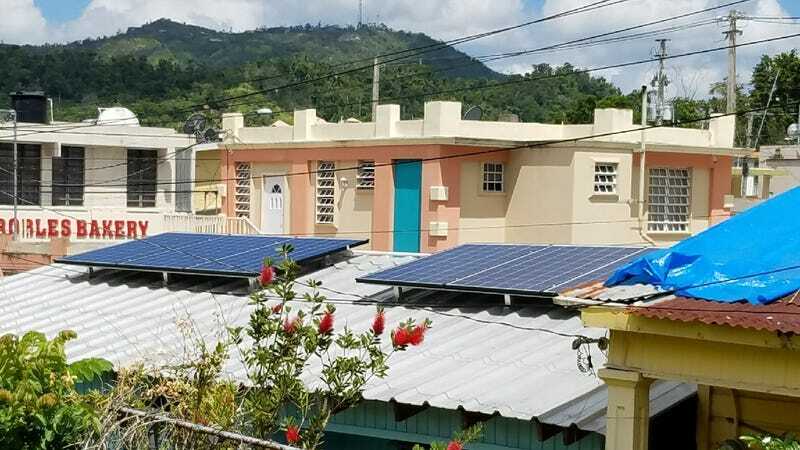 These blackouts become a thing of the past for people with solar microgrids, which operate independently of the island’s greater energy infrastructure, and which can often be taken down to protect them when a hurricane hits. Only two percent of Puerto Rico’s electricity came from renewables in 2016, but that number may be changing. Private solar companies like Sunrun and Sonnen have been donating many new installations. So have smaller local nonprofits, like Casa Pueblo in Adjuntas, Puerto Rico. An environmental group dedicated, in part, to increasing solar power throughout the region, Casa Pueblo’s been busy since Hurricane Maria helping families get solar panels on their homes. They’ve even installed panels on a local movie theatre so that next time power’s out, people can head to the cinema to find a sense of normalcy. They pay for all this through donations and grants, and by collaborating with other organizations that have the money, like the Puerto Rico Funders Network, which used money from its FORWARD Puerto Rico Fund (one of many funds in its network) to help Casa Pueblo with its solar efforts. Massol said he’s seen more panels pop up around the island since the hurricane—both thanks to Casa Pueblo’s initiative and through other private and nonprofit efforts. In March, Casa Pueblo gifted a solar system to a family in Adjuntas to support 88-year old Martina Santana, who suffers from a respiratory illness, and whose medicine requires refrigeration. Martin Santana (left) and his mother, Martina Santana (right), in their home. Living with solar has opened Santana’s eyes to what Puerto Rico’s future could look like. While the rest of their neighbors experience darkness, the Santana household remains lit up. This has landed them a cute and fitting name: the cucubanitos. Cucubano means firefly in Spanish, and during the last blackout, their home was the only light around. “From that day on, wherever we go, people ask, ‘How’s the mama cucubano and her cucubanitos?’” joked Santana. As Massol put it, Casa Pueblo hopes to construct more cucubanos throughout Puerto Rico “as a way to inspire.” And because people need to be prepared as the next hurricane season quickly approaches. Solar panels provide security for families who have them. For the Santanas, there’s also a sense of responsibility to help those nearby who might need power during a time of darkness, whether that means storing some food or meds in their personal fridge or buying a mini-fridge for the community. “It’d be a great blessing to help others,” Santana said. Unfortunately, Santana’s experience is the exception and not the rule right now in Puerto Rico. Solar can be pricey, and not everyone can afford it. Even the small system Rosa installed cost her a good $3,500. And Massol of Casa Pueblo says the equipment isn’t easy to come by. Charity can only go so far. More than 3 million people live on the island, and all of them need energy solutions. The federal government should help. The Department of Energy has identified 200 key locations for solar microgrids, and they’re looking at 400 more. These won’t be ready in time for this hurricane season, but maybe—just maybe—the island will be better prepared by the time the next Big One rolls through. Updated 11:37 a.m.: This post has been updated to clarify that the FORWARD Puerto Rico Fund is one of many funds under the Puerto Rico Funders Network, with which Casa Pueblo formal agreement is.